I’m often surprised by issues that arise when looking at outsourcing and the solutions you need to implement (if possible) to overcome them. On the other hand there are a lot of successes with some of them pleasant surprises (these are the says I give myself a High Five). 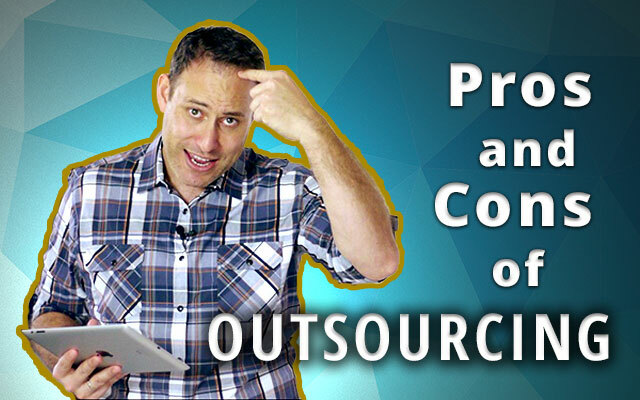 Over the years of outsourcing I’ve come to learn the good, the bad and the ugly and today I’m sharing the Pro’s and Con’s of outsourcing and the ways I deal with the challenges. Hello and Welcome, David Judge here and today I’m going to share the Pros and Cons of outsourcing. Now this is coming from a person that has over 86,000 hours of outsourcing, employing over 300 people in the last 4 years. Even more importantly, if you look closely at my slowly receding hairline you’ll see I’ve made so many mistakes that have cost me dearly and while I’ve overcome every challenge I would like to save you the same hairloss. So, lets delve down deep and share some areas you may have thought of and some that’ll make your toes curl. Concerns with Security and loss of IP are very serious and can be a real problem if not addressed properly. In reality, this is an issue when you employ people locally or outsource overseas and in many way when you employ a VA you are more covered than employing a person in your own country. So if you’re outsourcing you need your team to sign a legally binding NDA (Non disclosure agreement) meaning they can be prosecuted legally if we were to discover the theft of any knowledge or property. You should also use a fairly strict recruitment process designed to highlight and identify any issues at the beginning. Finally any sensitive information should remain cloud based and not on a VA’s individual computer, further reducing any risk. Whilst we’ve never has any issues we understand the importance of establishing a secure foundation and our approach is with a focus of prevention. While this is a serious issue, over-coming it is just as easy. If there are constant issues with power then buy a backup generator that kicks in right away. A good generator is about $150 and supplies enough power to run a computer, light, fan and internet connection. For internet, you just need to make sure your team have a backup internet connection or they work within an office space that guarantees a solid internet connection and power. It’s very common for people that outsource to have difficulty in understanding if their VA is doing the right job. I overcome this with a whole lot of measures I have in place along with a supervisor. You can check that video out here. You do have to invest the time to train a VA in the smaller details on how your business operates and any special tasks. Like anything in business Change Requires Commitment, and if you are looking at a VA for the first time (just as you would a local employee) you need to invest the time to ensure they fit inline with your business. This may also include the creation of systems and processes that show another person ‘How To’ complete a task. The good news here is once you train your first person, you can actually get them to learn and create new processes for additional team members. We find it’s very, very common for a VA to become a critical part of our clients businesses and as a result this comes very naturally for every client to continue to mould their VA. This means you may come across teething issues and you may need to adjust components of your business model. If you are considering a VA in your business then like any new change it’s important to acknowledge it may take time for a person to integrate into your business and rather than waiting for it to be perfect you may just need to take the plunge. From a ROI perspective, it’s totally worth it. This is very true, especially with the average business owner working 52 hours per week.. There are several ways a VA can help save you time, from completing slow, painful and repetitive tasks through to touching base with existing clients and diary management. Unlike local employees, you are able to have a VA working within your business at a much lower investment. The general skill level of a VA and if you have the right systems in place means they are a lot more effective sooner. This translates to a person that is integrated into your business faster and a direct saving on your bottom line. A lot of clients rely on their VA’s heavily and delegate tasks that would normally keep them away from their family or actually living a life. It is not uncommon once you have a VA and you delegate ongoing tasks to find yourself with more time to spend with your friends, sales appointments and even spending time on simple pleasures like being there for family dinner time. The main point here is you can actually CHOOSE how you invest your time. That’s right, unlike local employees, VA’s are considered a business expense and as a result are deductible. There are several ways we keep an eye on VA’s, all of which are designed to ensure you are getting the maximum result with the least amount of risk. Sure there are pro’s and con’s in any new introduction in your business. If you consider your decision with a “Solution Mindset’ and can clearly identify ways of overcoming the negatives along with with clear cut strategy, then you’re on your way to working smarter as opposed to harder. Ok, the next video we’re going to answer how you should deal with an underperforming VA. There are a lot of options here, especially if you have an existing VA and you want to bring them inline, rather than losing them. So as they say, this is going to be a Doozey!